This is a clip of Hurricane Irma as the eyewall passed close to Marco Island, FL. What hero's in the audience are up for kiting in this, with anything? 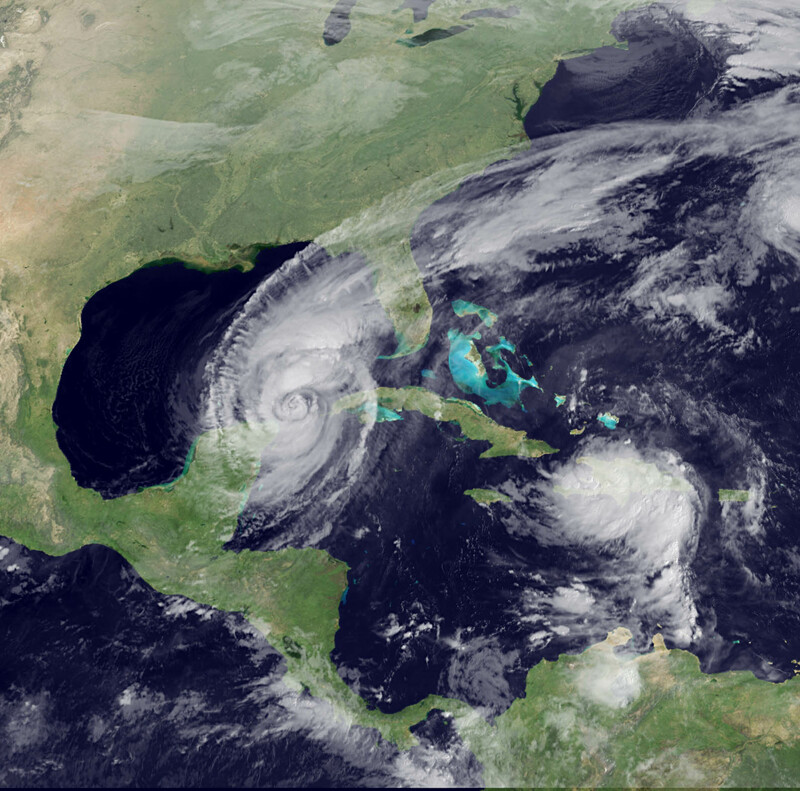 A hurricane can be many hundreds of miles across influencing weather over a 1000 miles or more. Anyone who kites anywhere in these massive weather systems, is "kiting in the hurricane." True story, that includes guys in sunny 15 kt. wind to suicidal twits who say they would like to kite in conditions such as shown in the video. You can be 400 miles from the eye and get caught in a squall gust to 60 kts. from 15 kts. or straight line wind burst the same or worse from a feederband. As good as kites are today, I don't know of many, any, which would be well powered in 15 kts and could safely manage flight in a gust to 60 kts.. Way too many guys have gone out in been some messed up by the feeder band squalls including some who killed themselves for their choice. So, nothing in this post is to discount the hazard, more to highlight the geographic context of the statement. Hurricane Wilma a particularly large hurricane. You could kite the Pacific coast of Guatemala and almost 2000 miles away in Bermuda and be "kiting in the hurricane" at the same time. Or, you could have been kiting in St. Augustine when this image was shot and been safe, barring squalls even though the high hurricane winds might be one or so days out from that area. Aside from squalls in feederbands, the truly dangerous high hurricane winds are much closer to the eye, hundreds of miles away. Tropical storm force winds can be plenty hazardous but are still usually within a couple of hundred miles of the eye or less and in specific directions. A lot depends on where you are in the hurricane, what the conditions are like. Hurricanes can be too large and variable to do otherwise. The smart money avoids hurricane hazards. We don't always do the smart thing however setting ourselves up for accidents. With forewarning and some understanding we can try however.